With Phi.3D 2.1& InfiPoints DP, DotProduct users can now access InfiPoints processing, modelling, and feature recognition capabilities directly from their DPI-8 Android tablet. HAMBURG, GERMANY, 11 October, 2016 – Today at INTERGEO 2016, DotProduct LLC and Elysium Co. Ltd. are announcing the release of InfiPoints DP. This powerful new Android application will allow DotProduct users to extract planar surfaces and cylinders from their scan data and export them to industry standard solid modeling formats, all on the same tablet used to capture the data. This greatly enhances the effectiveness of the DPI-8 Kit for use in surface-based CAD & BIM design environments, both on and off the tablet. The end-to-end workflow is being demonstrated live at the DotProduct booth (#A3.010) all week at INTERGEO in Hamburg. With the latest release of Phi.3D 2.1, all new and updated DPI-8 handheld scanners are ready for direct integration with InfiPoints DP. The new “Send Scene To” function in Phi.3D 2.1 offers several sharing and integration features, including direct export to InfPoints DP on the tablet. Within InfiPoints DP, DPI-8 users can extract planes and cylinders from the scanned point cloud data, and export these features directly to IGES & DWG CAD files. 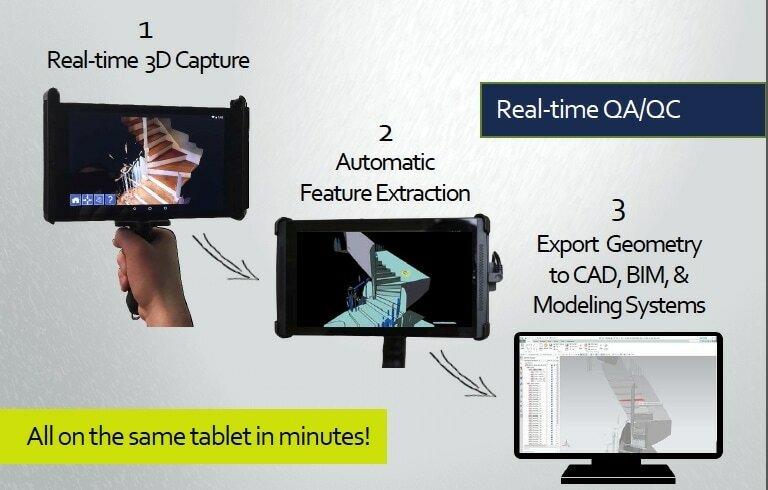 This scan to CAD workflow can now come full circle right on the tablet, with the ability to export DPI-8 scanned data into mobile CAD tools such as OnShape or Autodesk Fusion 360. Off the tablet, this workflow is enabling import into mainstream solid modeling programs such as SOLIDWORKS, Creo, and others. All new DPI-8 Kits will soon begin shipping with InfiPoints DP pre-installed, giving new DotProduct customers immediate access to InfiPoints DP, including a free 30-day trial. Existing DotProduct customers can also download and install the app from www.dotproduct3d.com. Elysium develops geometry handling and interoperability solutions for digital design and PLM markets. It has worked closely with CAD vendors under the official partnerships and also world-leading companies including Toyota Motor Corporation, Renault Sport F1 Team, Northrop Grumman Corporation. With millions of files translated and thousands of customers worldwide, its technology has been proved one and only. With this powerful background accumulated in its 30-year history, Elysium has stepped into a new industry to accelerate the utilization of 3D scanned point cloud data. Choose InfiPoints to experience the new generation; handling massive point cloud data with high performance, modeling from point clouds and more! Visit http://www.elysium-global.com/ for more information.